Aye, it's a bit early this year. 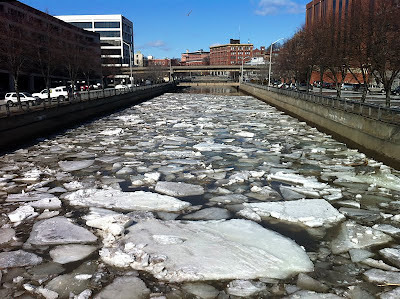 This photo was taken about twenty minutes ago (3/9/12) in downtown Bangor. In two weeks the 12th Annual Paddle Smart Symposium will kick off at the Bangor Boat Show (Bangor Civic Auditorium, March 24th & 25th). And in three weeks? The first whitewater race of the season, the St. George River Race.